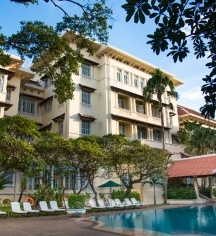 Raffles Hotel Le Royal has stood for 90 years, its walls bearing witness to countless events in Phnom Penh’s history. Hotel Le Royal was the largest building of its kinds in the area, designed uniquely to reflect Khmer perspectives on Art-Deco architecture. The luxury resort has even hosted Cambodian royalty, with His Majesty Sisowath Monivong attending the opening ceremonies in 1929. After being acquired by Raffles in the 1990s, the hotel underwent extensive renovations, reopening in 1997. Featuring 175 rooms, Raffles Hotel Le Royal provides unrivaled guest hospitality. Rooms feature amenities such as a minibar, flat screen televisions, bathrobes, designer toiletries, nightly turn-down service, and free WiFi. There are restaurants on-site that offer several types of native cuisine, including French and Khmer inspired dishes. The Hotel Le Royal offers nine, extravagant meeting rooms to those interested in hosting events for grand events. Guests to the hotel have the option of visiting the Raffles Spa, where they can swim in the 25-meter pool, relax in the sauna, steam room, or Jacuzzi, or take individualized yoga classes. There are even special treatments, such as massage and facials, that use Dermatologica products. Raffles Hotel Le Royal is close to many popular tourist attractions. Wat Phnom, a very tall Buddhist Temple, is a five-minute walk from Le Royal, as is the Royal Palace, where the King of Cambodia has lived since its construction in 1866. Guests are also within a two-mile radius of Central Market, where they can find a fascinating range of goods and souvenirs. Raffles Hotel Le Royal, a member of Historic Hotels Worldwide since 2018, dates back to 1929. The Elephant Bar's signature cocktail is the Femme Fatale, created especially for Jacqueline Kennedy during her visit to Cambodia in 1967. Airport Transportation: There is a 24-hour airport shuttle service available. Contact the property in advance for details. Cancellation Policy: Cancellations must be made by 6:00 p.m. on the day of arrival. Deposit: A credit card guarantee is required at the time of booking. Extra Person Fees: A charge of $50 will be assessed. Occupancy Restrictions: Maximum 3 people in the room with an extra bed and according to room type category. Rollaways: Available upon request; $40.00 USD per night. Smoking Policy: Raffles Hotel Le Royal has designated areas for smoking. 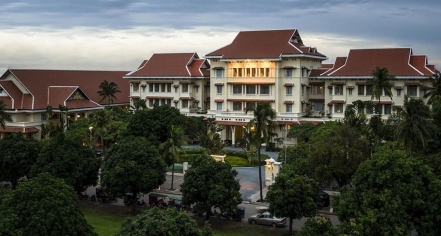 Raffles Hotel Le Royal has stood for 90 years, its walls bearing witness to countless events in Phnom Penh’s history. Hotel Le Royal was the largest building of its kinds in the area, designed uniquely to reflect Khmer perspectives on Art-Deco architecture. Learn more about the History of Raffles Hotel Le Royal .